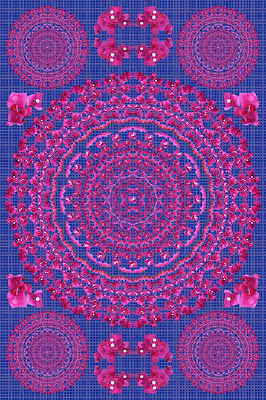 This mandala is made with bouganvillia flowers. I use what I call a wave effect in many of the rings. Rather than creating even concentric rings, I get the undulating motion you see in this composition. 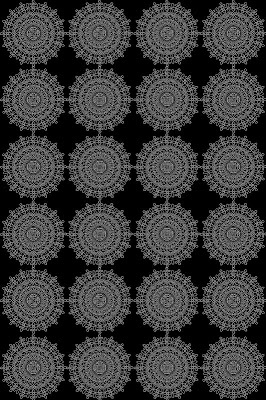 In the corners, I have placed reduced versions of the central mandala. Now, let's talk backgrounds. For posters on Zazzle, I use dimensions of 23" x 34.5". If I divide that up into four segments across, I get 5.75". If I divide the 34.5" by six down, I also get 5.75". So I can make a pattern of 5.75" squares. 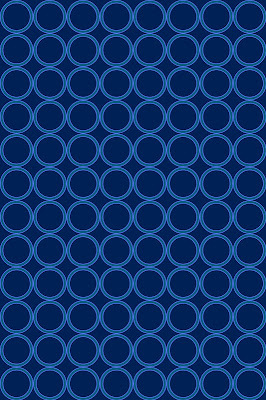 Here I created the blue circles and fit 4 in a square of those dimensions. I then duplicated across and then down, until the pattern filled the whole page. One can then play with color, contrast, brightness and so on to get the desired effect as a background. Next, I did the same thing with these celtic knot designs. The possibilities are endless. 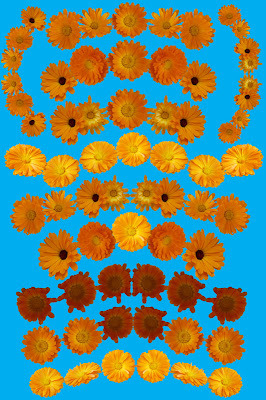 I then took the calendula mandala and put it over each of the backgrounds. Here, I show it over the celtic knots. One neat feature of this design involves the reduced mandalas fit into the corners. 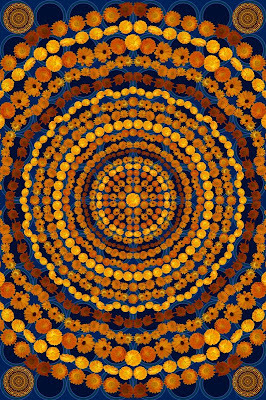 While the large, central mandala expands off the page; the smaller ones include the whole mandala. I am impressed by the software that allows that. I liked the wave efffect I got with the bouganvillia clusters. 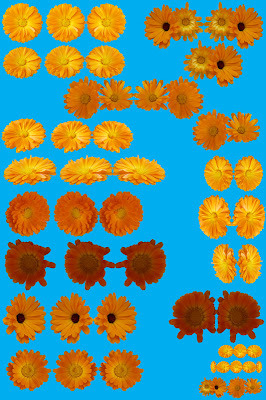 The calendula flowers are small, and suited to curved combinations that work well for the waves. Because they don't grow in clusters, however, I needed to create my own combinations. Before assembling the mandala, I created this page with individual flowers and mirror image pairs. I then created a second page with a series of curved combinations as you see below. Together, the two pages offered a large variety of elements to work with in composing the mandala. My thought is that with large blooms with a lot of detail, the concentric circles of individual and paired blooms is best. With smaller blossoms and especially the clusters, then a larger number of concentric rings is called for, and the waves add interest to the design. 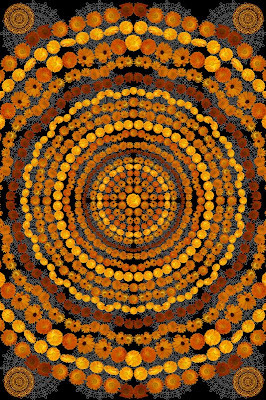 Here, I give you the same mandala over the circle pattern. You can let your imagination run wild with this stuff.